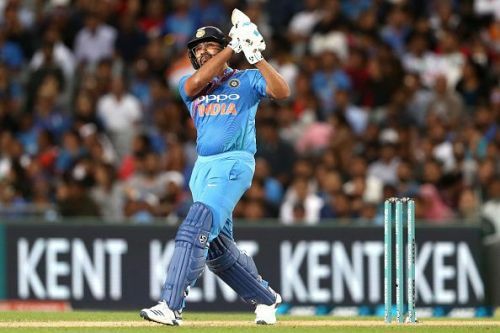 Indian opener and stand-in skipper Rohit Sharma became the first man from his country to smash a century of sixes in T20I cricket in the second T20 between India and New Zealand. The elegant willow-wielder achieved the feat in the fourth over off Scott Kuggeleijn, when he just flicked a very straight ball off his pads and deposited it over the boundary rope. Rohit Sharma is one of the finest limited overs batsmen going around at the moment, perhaps only bettered by his national teammate and captain Virat Kohli. The right hander's sweet timing, strength and technique allows him to strike massive sixes. Heading into the second T20I on a 1-0 deficit, the Men In Blue were asked to field first. A fantastic death bowling performance from the bowlers reduced the Kiwis to 158/8 in 20 overs. And then stepped in Rohit Sharma and Shikhar Dhawan, who constructed a match-winning partnership of 79 for the opening wicket. It was Sharma who got his side off to a flyer by taking charge of the scoring rate and clawing the game away from the Black Caps, who were desperate for early wickets, especially while defending a below-par score. He got out to Ish Sodhi just after having scored a half-century, which included three fours and four scintillating maximums. He hit his 99th six of the pacy Lockie Ferguson in the first ball of the third over and then continued to up the gears as his innings went on. And in the fourth over, Rohit, with all the time in the world, just flicked a straight ball over fine leg for a six. The 100th six not only showed us how exquisite he is on the eye but also was a testament to Sharma's abilities with the bat. At the end of the innings, Rohit was on 102 sixes, just one behind Martin Guptill and Chris Gayle, who top the charts. Behind him are the destructive NZ duo of Brendon McCullum and Colin Munro. The highlight of his innings though, was that Rohit Sharma surpassed Guptill to become the highest scorer in T20 Internationals. This half-century also meant that Rohit Sharma has the most number of 50+ scores in T20Is (20). Sharma fell in the second ball of the tenth over for a well-fabricated 50 off just 29 deliveries. At the end of 16.2 overs, India were 138/2, with just 22 required in as many deliveries. The series decider will unfold on 10 February.